The various projects scheduled for the next few months will require investments that range from $500,000 to almost $3 million per vessel. In the waning days of the 112th Congress, the Senate approved a bill Iâ€™ve been fighting to pass that protects more than 35,000 acres of Sleeping Bear Dunes National Lakeshore. Lake Erie is a big, wet place. By surface area, it is the 11th largest lake on the planet, stretching some 241 miles by 57 miles. In that often murky world under the surface of Lake Erie is a lot of fish. Conducting a census of those residents is a fundamentally difficult task, flush with challenges. As Lake Michigan plunges toward uncharted low water levels, Wisconsin's lakeshore communities - from Milwaukee to the tip of the Door Peninsula - are scrambling to cope. At Milwaukee's South Shore Yacht Club, the docks are now closer to catwalks, towering seven feet out of the water. Kenosha County could be part of state plans to improve the Lake Michigan shoreline for kayakers, canoeists and other water users. The Lake Michigan Water Trail project includes hopes of adding camping grounds, bathroom facilities and places to launch water vessels along the shoreline, including on land in Kenosha and/or Pleasant Prairie. Other improvements might include signs and maps so visitors know what amenities are available where. Improvements will help draw tourism, said Jeff Prey, Wisconsin Department of Natural Resources park system senior planner. Mercury has found its way not only into our households, but also into our aquatic environment, according to this public service announcement from the Michigan Department of Community Health. Coho and Chinook salmon run up the Red Cedar River in the fall, steelhead in the spring. The portion of the river that meanders through Michigan State Universityâ€™s campus supports healthy numbers of largemouth and smallmouth bass, bluegills and sunfish and walleye. An Indiana company pleaded guilty Thursday in Windsor of possessing live invasive Asian carp and has been fined $30,000. The fish importing company Phoenix Fish Farms LLC also had to forfeit to the Crown 1,179 kilograms of seized bighead and grass carp. State wildlife biologists are stocking native herring in Lake Ontario near Rochester this week to provide nutritious prey for trout and salmon. New York Environmental Conservation Commissioner Joe Martens says re-establishing spawning populations of lake herring will diversify the prey fish community and add stability to the lake's ecosystem. Though it is often taken for granted, Southeast Michigan is a Great Lakes metropolis. It is time to rethink our defining assets and rebrand ourselves as a freshwater capital. Local governments can apply for small grants to help clean up Michigan's rivers, streams and creeks. The Department of Environmental Quality and the Great Lakes Commission said Tuesday they will divide $25,000 into smaller amounts for cleanup projects. 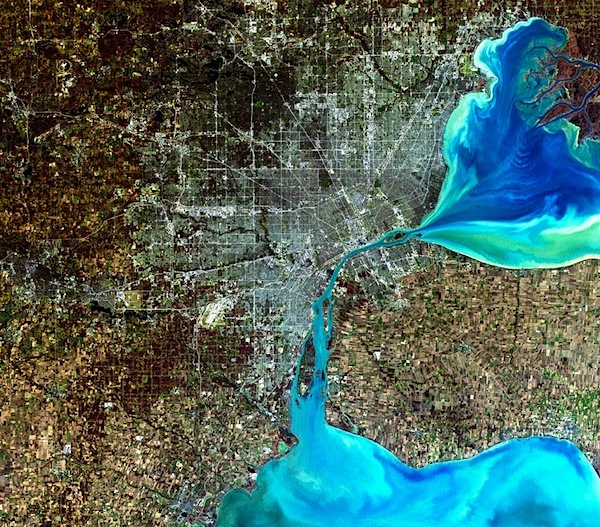 Water levels are low enough in the Great Lakes that parts of sunken ships have become visible. John Karl, science communicator for the University of Wisconsin Sea Grant Institute, says Wisconsin actually leads the nation in the number of shipwrecks listed on the national register of historic places. He estimates there are more than 700 sunken ships near Wisconsin, and some are well preserved because of the Great Lakes' cold, deep, fresh water. A total of 252 pages are available.